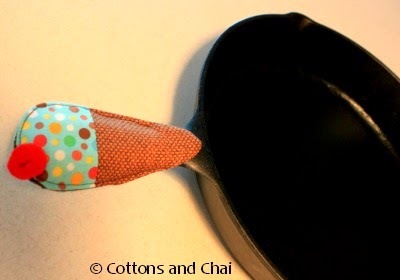 Cottons & Chai: Pan Handle Covers: Our 'Hottest' idea yet! 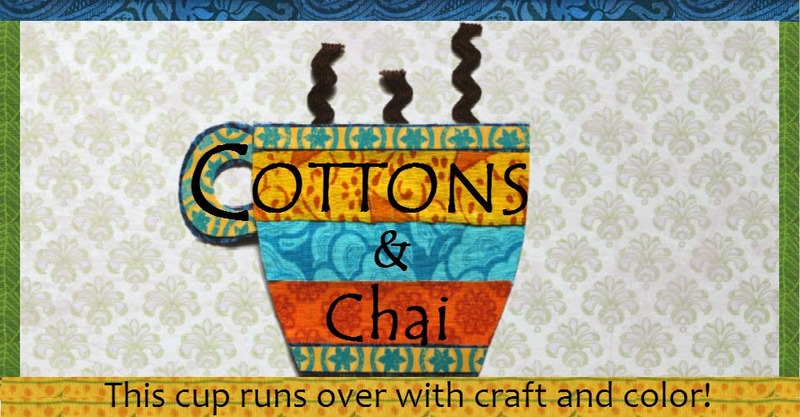 Quick note: We're sending in this post to the September Sew Crazy Challenge at Crazy Little Projects. This month's theme happens to be In The Kitchen! Here's a not-too-uncommon scene from our kitchen: Either my husband or I am cooking something mouth-watering in our beloved Lodge cast-iron pan (Sometimes we cook together and sometimes we fry solo). When it's all done we announce 'Dinner's ready!' with great panache, which swiftly turns to pan-ache as, in haste, we burn our fingers on the searing pan handle. 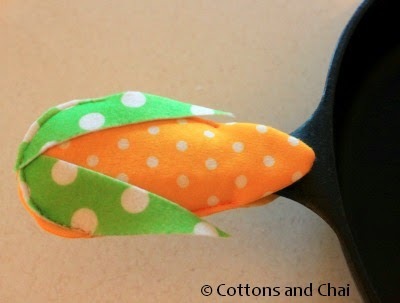 Then once I stop pan-icking, I remind myself to make one of those nifty pan covers to safely man-handle my pan-handle. 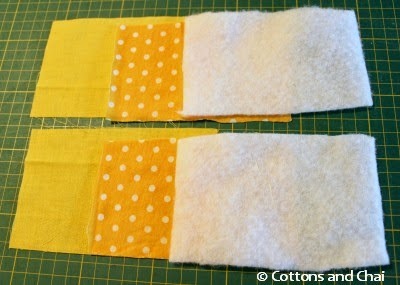 Next I cut out 2 rectangles each (that measured the same as our original one) from yellow polka-dotted fabric, yellow lining fabric and batting. I made a sandwich by first placing the batting piece on work surface. 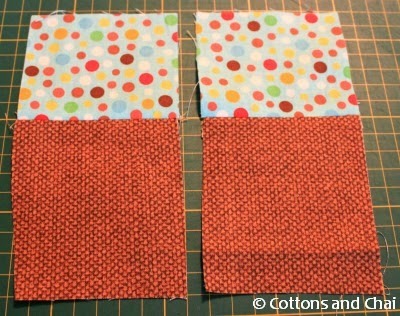 Second placing the polka fabric right side up and third placing lining fabric on it wrong side up. Ditto for the other sandwich. Then I traced the outline of the curvy triangle template on both sandwiches and marked gaps about 2" wide for turning inside out. .... and turned them inside out. 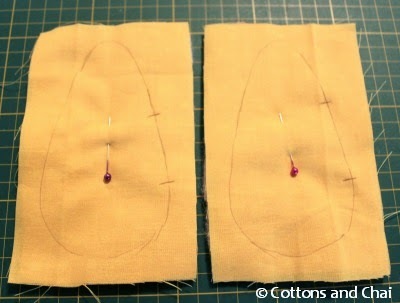 After that I just put them together lining sides facing each other, sewed around and left a gap at the tapered end to slip onto the pan handle. 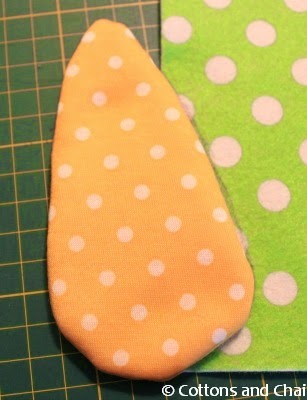 Now for the detailing: I cut the husk by positioning the cob on some green felt to get its shape. And again on the opposite side. 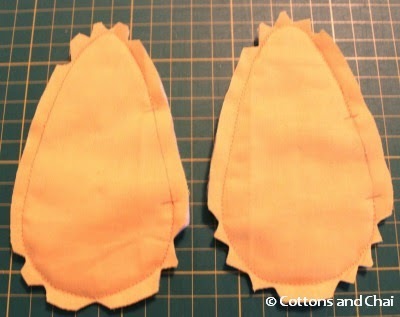 Then I just placed the husks on the cob and sewed around the edges. That's one corny pan handle cover ready! 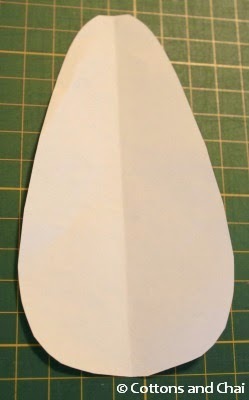 For the next one - a fish, I split the triangle again, but this time on the tapered side. And of course I sewed a button onto the it. 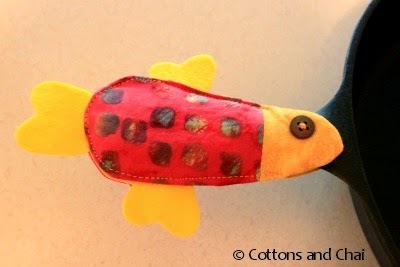 After all a fish without an eye is just 'fsh'. 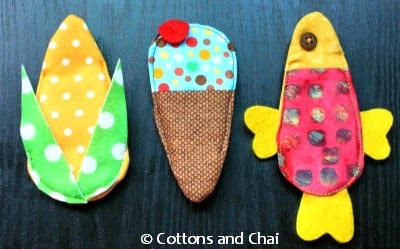 And that's how one little pattern piece can result in completely different but equally delightful little covers. So is there pan-demonium in your kitchen too? 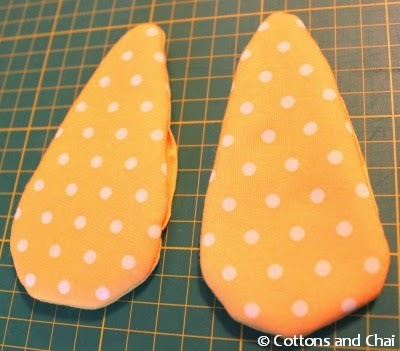 If you come up with an idea for using the curvy triangle and make a cover with it, don't forget to share it with us! This is unbelievably cute!!! You are so creative. 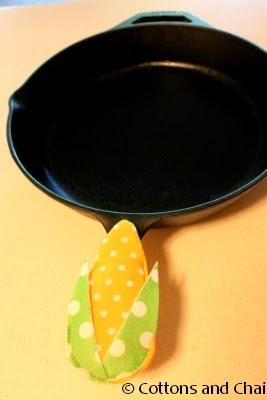 They are not only practical but so beautiful, I can imagine serving cornbread baked in the skillet with the corn handle cover, a fish fry with the fish one, the pizza or pie or carrot or okra or rocket...all are genius ideas! Priti - Lol, yes a pan handle to match the recipe is a great idea!